Gorgeous views of Mt. LeConte, games, stylish mountain interiors, and classic cabin exteriors await at The Best Cabin Ever in the Gatlinburg Falls Resort in the Great Smoky Mountains. This 2-bedroom, 2-bathroom cabin with space for 8 guests was made for fun family vacations, weekends with friends, and couples’ retreats. 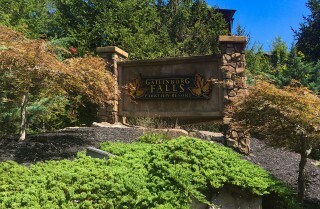 In downtown Gatlinburg, you’ll find plenty of restaurants, shops, and attractions to check out, but when you’re ready to relax and hang out, this Gatlinburg cabin rental will be a great place to escape. 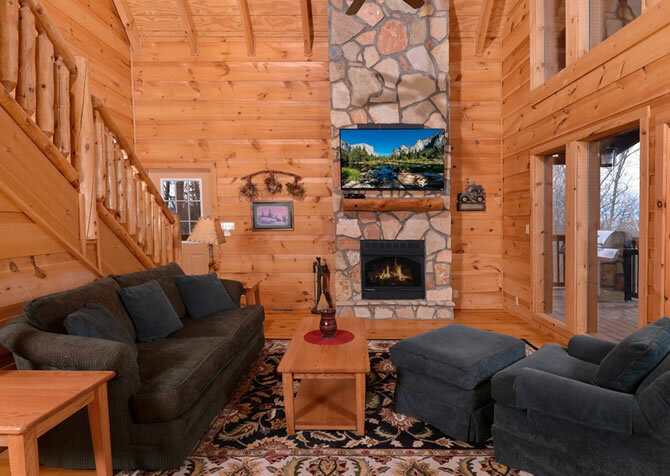 In the lovely living room, cozy up on mountain-motif sofas, flip on the flatscreen TV mounted on the stone (electric) fireplace, and enjoy spending quality time with family and friends. Just steps away, the fully equipped kitchen boasts black appliances, plenty of dishes and glassware, and a table for 8 that lets you sit down with the whole group. When dinner’s over, clear the table for board games and cards or let the kids do crafts or decorate holiday cookies. For some fun, head to the rec room for arcade games, pool, and air hockey! Or watch movies with a DVD player, VCR, and Blu-ray player in the cabin — just bring your favorite flicks! And the kids (and kids at heart) will love the Nintendo Classic gaming system with games pre-loaded. The rec room and living room also feature sleeper sofas for extra space. Before heading to bed in the king-size beds, guests can climb into the outdoor hot tub to soothe tired muscles, sit back in the rocking chairs with cold drinks or mugs of hot coffee, and soak up those beautiful mountain views. You’ll even have community pool access in summer! 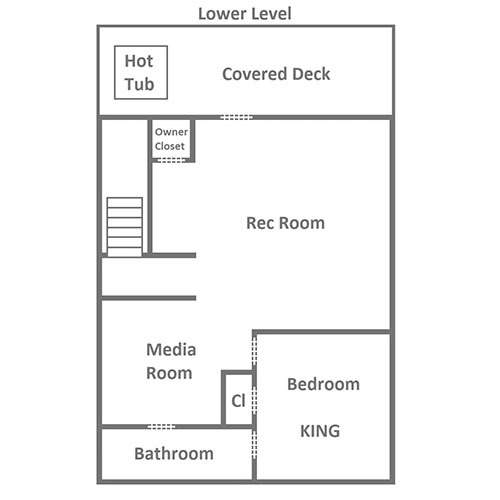 And don’t forget homey conveniences like high-speed internet, a washer and dryer, TVs in the bedrooms, and a charcoal grill for cookouts. After all, this is The Best Cabin Ever — and it’s waiting for YOU in Gatlinburg, TN! Step into relaxation as you plop on the living room couch (doubles as a sleeper sofa) and flip on the flatscreen TV. Better yet, bust out the new novel you’ve been meaning to read and unwind in the loveseat or armchair by the mood-setting electric (no heat) fireplace. The coffee table is the perfect place to rest drinks and snacks or whip out a deck of cards for a fun family game. And on warm summer days, the ceiling fan overhead keeps the space cool and comfy. 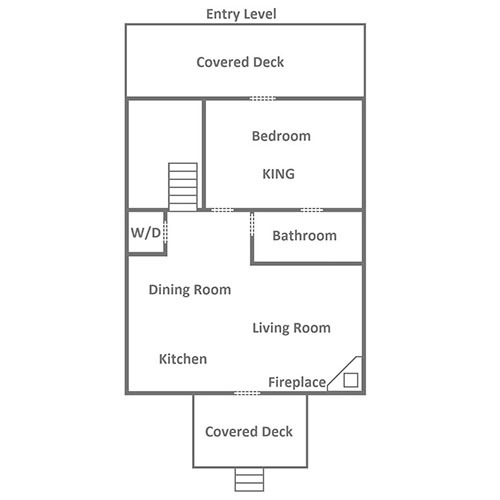 Just off the living room awaits the fully equipped kitchen, bearing a convenient open concept, plenty of counter space, chic black appliances, and a stainless-steel double sink. Prepare hot meals on the stove, bake fresh chocolate-chip cookies in the oven, pop buttery popcorn in the microwave, keep drinks cool in the fridge, and brew endless pots of joe with the coffeemaker! There’s also a dishwasher so you don’t have to get your hands dirty while on vacation. The dining area lies in the center of the kitchen. With a large table for 8, the whole group can come together for quality mealtimes. Plus, this versatile space is perfect for planning outdoor activities, like hiking through the national park or whitewater rafting down Pigeon River. Feel free to use the table for all your admin and creative needs as well, like checking emails, sketching the Smokies, or journaling. 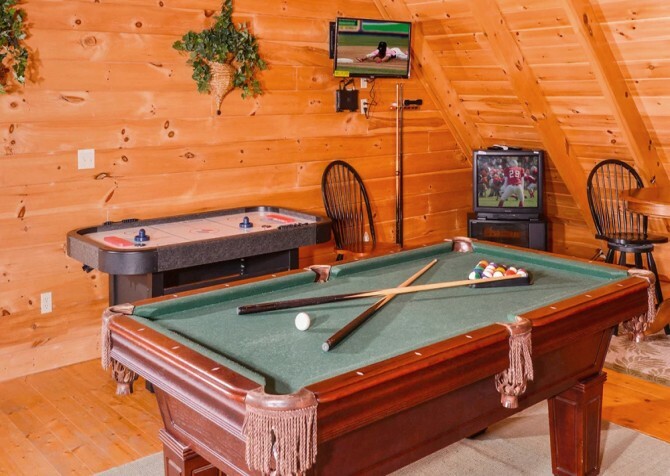 It’s time to rev up this cabin party — in the rec room at The Best Cabin Ever! Shoot pool with your best pals, crush your spouse at air hockey, and defeat the highest scores on the Multicade and Golden Tee Complete arcade units. After showing your friends and family who’s boss, take a breather on the back deck with calming mountain views or chillax with a cold one at the pub table for 2. There’s even a media nook with a mounted flatscreen TV, Nintendo Classic with pre-loaded games, and a sleeper sofa for extra gaming and entertainment fun! Bedtime has arrived, and the king-size beds will be a welcome amenity after walking around town and exploring area attractions all day. Both bedrooms are quite spacious, so you’ll have plenty of room for morning stretches on the carpet. And each bedroom boasts a flatscreen TV - with a Blu-ray player in the entry level bedroom - to keep the entertainment rolling and a ceiling fan to keep you comfortable while you snooze. One bedroom even offers direct deck access, which is perfect for admiring the morning mountain views with a cup of joe before heading to breakfast. 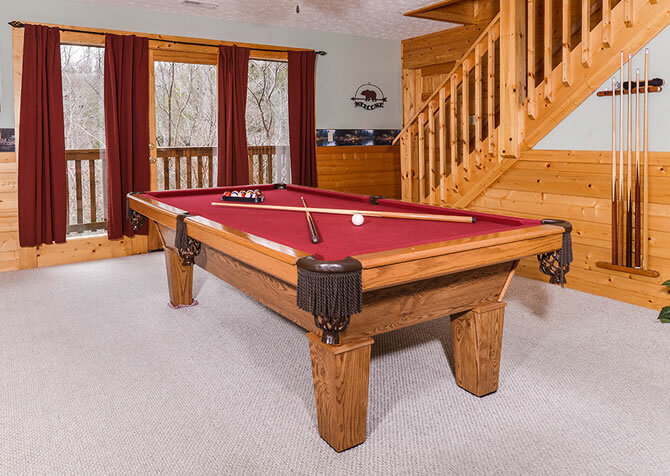 As The Best Cabin Ever sleeps up to 8 guests, there are also 2 sleeper sofas in the home, one in the living room and the other in the rec room. After traveling along paved roads, pull into the paved driveway at The Best Cabin Ever. There is parking for 3 at this semi-private, motorcycle-friendly abode, so carpooling won’t be an issue — plus you can bring your bike for epic mountain rides! With a charcoal, picnic-style grill, cookouts are made easy and taste Smoky (wink). 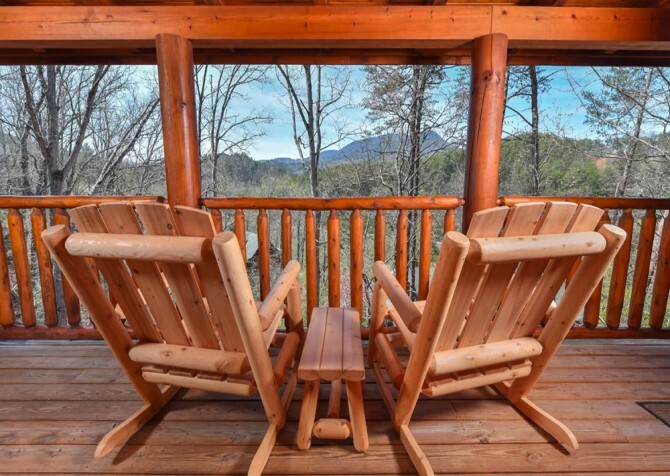 Sit back and relax with a burger in the rocking chairs while soaking in the majestic mountain views from the back decks. Later, enjoy a soothing dip in the steamy hot tub! What else can you find at The Best Cabin Ever? Sit down…this may take a while! 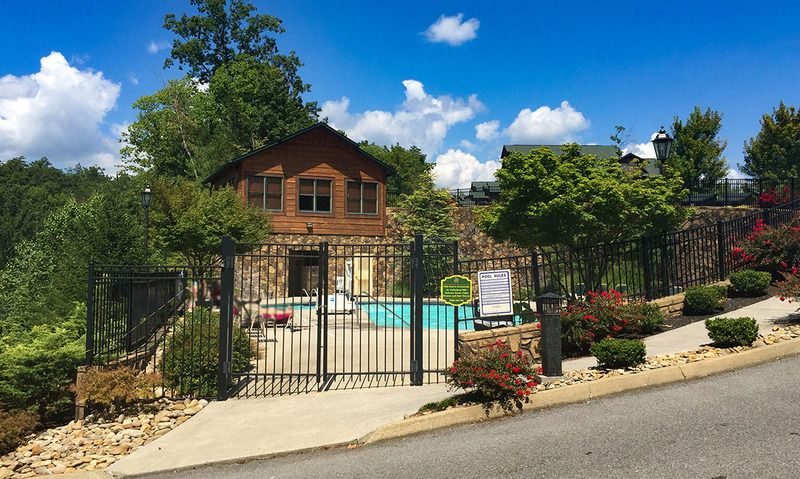 Located in Gatlinburg Falls — Parkview Resort, community pool and gym access are yours! 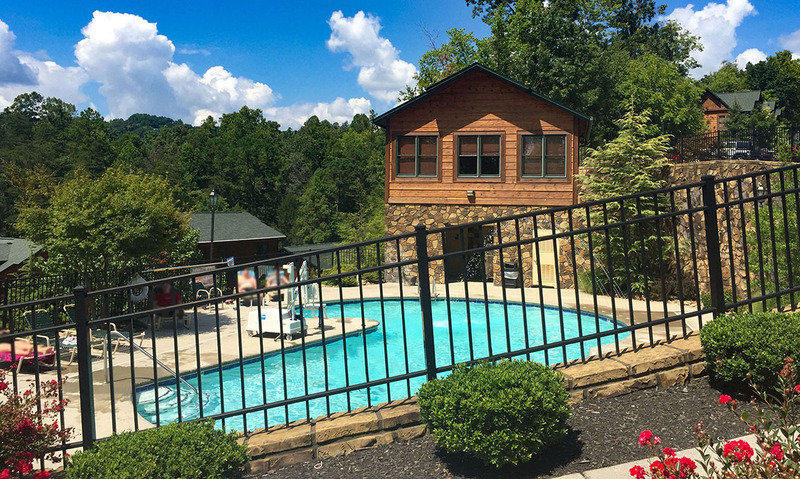 Splash with the kiddos in summer and keep up with your workout routine throughout your Smoky Mountain stay. Hop on the complimentary high-speed Wi-Fi and share trip videos with your friends back home with ease. There’s also a provided washer and dryer so you can pack light, leaving more room for souvenirs. And let’s not forget the Blu-ray and DVD players plus Nintendo, great for modern movies and classic games! Less than 3 miles to the heart of Gatlinburg, The Best Cabin Ever not only provides ace amenities for all ages to enjoy but also a convenient location to downtown restaurants, boutiques, and attractions. This cabin isn’t The Best for nothing! Sky-high stacks of fluffy, steamy pancakes with melted butter squares and hot maple syrup…Flapjack’s Pancake Cabin does mountain breakfasts right! View sea life in the mountains at Ripley’s Aquarium of the Smokies, featuring exciting interactives. Play with penguins, pet jellyfish and stingrays, and take a ride over Shark Lagoon in a glass-bottom boat! "Wonderful cabin with amazing views. Game room was a bonus. Looking forward to returning!" "The best cabin ever is well maintained, and offers great views and a great location. I was really pleased with the cabin and I cannot wait to visit Spring break." Yay! We are so happy you enjoyed your stay at The Best Cabin Ever! The mountain views are quite fantastic, and we are excited for you to see them in spring. See you soon! We're so happy to hear you had an awesome stay at The Best Cabin Ever! Yes, the game room is pretty sweet! We look forward to your next visit to the Smokies. Come back soon!